South African President Jacob Zuma reacts during the closing address at the 54th National Conference of the ruling African National Congress (ANC) in Johannesburg, South Africa, Dec. 21, 2017. South Africa’s Constitutional Court ruled Friday that parliament had failed to hold President Jacob Zuma to account for state-funded upgrades to his home and must launch proceedings that could remove him from office. “We conclude that the Assembly did not hold the president to account. ... The assembly must put in place a mechanism that could be used for the removal of the president from office,” Judge Chris Jafta said, handing down the televised judgment, which was supported by the majority of the court. The Economic Freedom Fighters and other small opposition parties brought the constitutional issue to the court. Deputy president of South Africa Cyril Ramaphosa greets an ANC member during the 54th National Conference of the ruling African National Congress (ANC) at the Nasrec Expo Center in Johannesburg, South Africa, Dec. 18, 2017. Zuma, 75, is in a weakened position after Deputy President Cyril Ramaphosa was narrowly elected leader of Zuma’s ruling African National Congress (ANC) last week. However, Zuma’s faction still retains key positions in the party, and he has survived no-confidence votes. In March 2016, the Constitutional Court ruled that Zuma must pay back some of the roughly $15 million in state money spent upgrading his private home. FILE - Public Protector Thuli Madonsela addresses journalists in Johannesburg, South Africa, June 7, 2016. 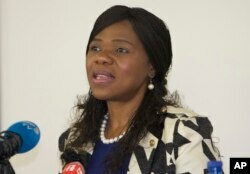 The unanimous ruling by the 11-judge court said Zuma had failed to “uphold, defend and respect” the constitution by ignoring the findings of former Public Protector Thuli Madonsela, whose office is an anti-graft watchdog with a strong constitutional mandate. Zuma has since repaid 7.8 million rand ($631,000), the sum determined by the Treasury as the “reasonable cost” he should bear, while also surviving a no-confidence motion in parliament where members of own his party voted to oust him. But opposition parties have argued that parliament has not done enough, given the gravity of the court’s findings. Zuma has denied wrongdoing over many of the corruption allegations that have swirled around his presidency. Last week he sought leave to appeal a court ruling ordering him to set up a judicial inquiry into influence-peddling in his government.